Abbas Falasteen Hamideh is Executive director of the Palestine Right to Return Coalition. He is based in Cleveland, Ohio. According to the Anti-Defamation League, Abbas Hamideh has "a record of praising terrorist groups including Hamas and Hezbollah, equating Zionists with Nazis, and denying Israel’s right to exist. Hamideh was born and raised in Puerto Rico." 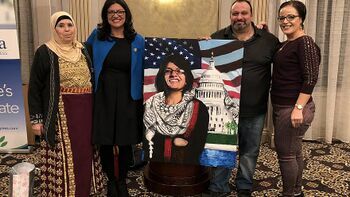 Abbas Hamideh poses with Rep. Rashida Tlaib (D-Mich.) at a swearing-in ceremony and private dinner in Detroit on Jan. 12, 2019. Credit: Abbas Hamideh/Twitter. Abbas Hamideh poses with Rep. Rashida Tlaib at a swearing-in ceremony and private dinner in Detroit on Jan. 12, 2019. "Congratulations! Rashida Tlaib won the Democratic nomination for the House in Michigan's 13th District, putting her on track to become the first Muslim and Palestinian-American congresswoman in US history. She will run unopposed in November's special elections as the Republican Party has not put forward any candidate to contest the seat. The daughter of Palestine did it! Mabrook! — with Abbas Hamideh and Rashida Tlaib." 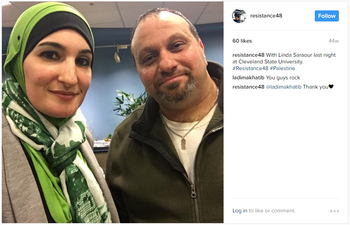 Twitter personality Amy Mek posted a video on Twitter showing Rashida Tlaib's connection to Abbas Hamideh on March 28 2019. ""From the River, to the Sea"...the call for the genocide of the Jewish people!" On March 28 2019, Abbas Hamideh doxed NYC councilman Kalman Yeger by providing his home address on Facebook and asking people to go to his home and protest. Event is endorsed by: Jewish Voice for Peace, Black Lives Matter Brooklyn, ‬‪South Brooklyn Democratic Socialists of America, New York Progressive Action Network, Union of Arab Women & Yalla Brooklyn. "Democratic councilman Kalman Yeger recently tweeted the following statements: “Palestine doesn’t exist” and "Ilhan Omar is an anti-Semite". "By his own admission, this is not the first time Councilman Yeger has denied the existence of Palestinians. His offensive comments delegitimizes [sic] the entirety of Palestinian people and culture. Simply put, his saying Palestine doesn’t exist, means he is saying that Palestinians don’t exist. "Join us at this protest to denounce Councilman Yeger’s abhorrent comments and stand in solidarity with the Palestinian people. "This protest will take place in front of the councilman’s home. Don Bryant is listed as a host of a Facebook event titled "Support Palestine in DC 2017! (Official)." Other hosts are Abbas Hamideh, Brian Becker, Sarah Sloan, Abbas Bazzi, Faaiza Amna Hameed and Robert Martin. Al-Awda, The Palestine Right To Return and our co-organizer, ANSWER COALITION will once again spearhead this National Rally to Support Palestine in DC 2017! This rally will start at The White House with thousands of people from across the nation and around the world and ending up in front of AIPAC's annual convention! AIPAC is the primary organization lobbying to continue the brutal illegal occupation of Palestine for over 68 years. We must protest to end this outrageous lobby that ultimately supports the oppression and ethnic cleansing of the Palestinian people! Please come out and support the Palestinian people in their noble struggle to be free! End AIPAC! End the illegal occupation of Palestine from the River to the Sea!" Don Bryant organized "protest" in March, 2017 attended by members of the front group for the Revolutionary Communist Party, REFUSE FASCISM. "Join this protest. Stand against white supremacist, Islamophobic hate groups in Ohio!" "The Cleveland group...will feature speaker Trevor Louden,[sic] another xenophobic extremist. Louden[sic] will be promoting his film, The Enemy Within,[sic] which alleges that there’s a Muslim/ communist conspiracy afoot to overthrow the U.S. government." Abbas Falasteen Hamideh was "invited" to the event. Abbas Falasteen Hamideh was listed as a speaker at a panel discussion titled "Dreaming to be Free: Ferguson, Palestine and the Fight for Migration Justice" at the Left Forum 2015. Abbas Falasteen Hamideh Member Cleveland spoke at an August 2, 2014 "Rally Against Israeli Violence in Gaza", organised by ANSWER Lafayette Park. Speakers included; Osamah Abuirshaid National Coordinator American Muslims for Palestine, Salim Adofo Vice Chair National Black United Front, Lydia Catina Amaya Community Organizer Damayan Migrant Workers Associatio, Mohsin Ansari Chair ICNA Relief USA, Nihad Awad Co-Founder and Exec. Dir. Council on American Islamic Relations, Brian Becker National Director Act Now to Stop War and End Racism (ANSWER), Mahdi Bray National Director AMERICAN MUSLIM ALLIANCE POLITICAL ACTION, Karina Garcia Organizer Act Now to Stop War and End Racism (ANSWER), Carol Gay President New Jersey Industrial Union Council, Tarak Kauff Board Member Veterans for Peace, Alli McCracken National Coordinator CodePink: Women for Peace, Ray McGovern Analyst (Former) Central Intelligence Agency, Carl Messineo, Co-Founder Partnership for Civil Justice, Akbar Muhammad Representative, Nation of Islam, Lucy Murphy Singer, Mike Prysner Veteran Iraq War, Eugene Puryear Member Act Now to Stop War and End Racism (ANSWER), Tareq Radi Founder George Mason University->Students Against Israeli Apartheid, Khalilah Sabra Executive Director MAS Immigrant Justice Center, Cornel West Professor Emeritus Princeton University->Center for African American Studies, Ann Wright Activist, Fadi Zanayed Attorney Palestinian American Council. This page was last modified on 29 March 2019, at 03:51.